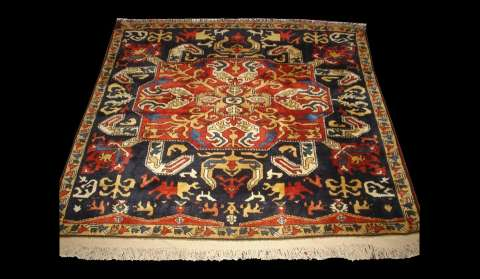 Azerbaijani applied arts, especially carpet weaving, occupy a special place in the history of its national culture. The most widespread folk art is carpet weaving. It made its way into the everyday life of the people of Azerbaijan and turned into a symbol for the nation. Because of their high aesthetic value, fleecy and pileless carpets, decorated with various patterns and signs, are used to decorate the walls and floors of marquees, huts, homes, nomads` tents, and other buildings. 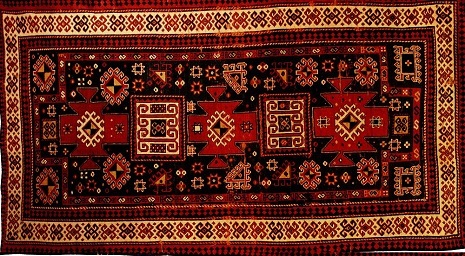 Regarding the results of archeological excavations and historical records, carpet weaving was shown to have occurred in Azerbaijan during the Bronze Age (the end of the 2nd millennium to the beginning of the 1st millennium BCE). The ancient history of carpet weaving is evidenced by a clay figure of a horse with its horse-cloth decorated with flowers, found in Maku city in Southern Azerbaijan (dates to the 2nd millennium BCE) as well as a golden plate picturing a lion with a decorated cloth found in the hills near Hasanulu on the coast of Lake Urmiya (1st millennium BCE). Archeological excavations in Mingechevir unearthed the remnants of palases (carpets without pile) and carpets in catacombs dating back to the 1st -3rd centuries. Herodotus, Claudio Ptolemy, Ksenofond, and other ancient historians provided information regarding the development of carpet weaving traditions in Azerbaijan. 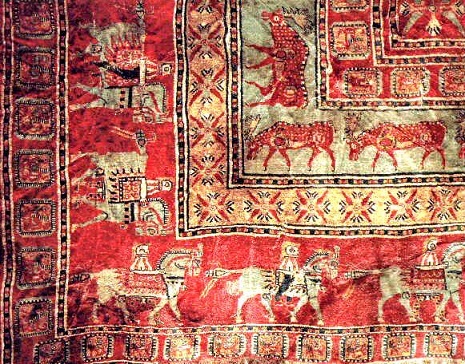 During the reign of the Sasanies (3rd - 7th centuries) this art was steadily developing in Azerbaijan, in which carpets were made of silk and golden-silken threads. Albanian historian, Musa Kalankatli (7th century), provided accounts of silken clothes and multi-color carpets. Weaving of carpets with golden-silken threads and jeweled decorations became a traditional activity during the 16th - 17th centuries. 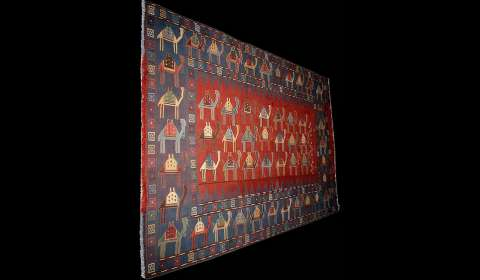 Carpets without piles were woven mainly in Tebriz, Shamakhi and Barda. These very expensive carpets woven for the feudals were called zerbaf. Anthony Jackinson, who visited Azerbaijan in the 16th century reported that carpets were woven of golden-silken threads in the summer residence of Abdulla khan in Shamakhi. The Dutch traveler Yan Straits (17th century) reported that a Shamakhi ruler had a horse-cloth made of golden threads, which was decorated with pearls and jewels. Written sources of the middle centuries give interesting information about the products of Azerbaijan carpets weaving and their graphical specifications. In a written work `Hudud al-alem`(`The boundaries of the world`) an unknown author gives the information about palases and horse-clothes(chul) weaved in Mugan, and carpets weaved in high-tones in Nakhchivan, the epos `Kitabi-Dede Gorgud` tells us of silken carpets, the works of Abul Ula Ganjevi, Nizami and Khagani (XII century) give the information of fleecy carpets and that of without pile. 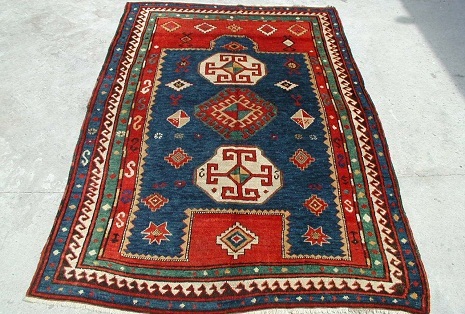 In XII-XIV Azerbaijan exported many carpets and carpet products to foreign countries. Those carpets, attracting attention with delicate ornaments and decorations are reflected in the works and miniatures of many painters of the Europe. 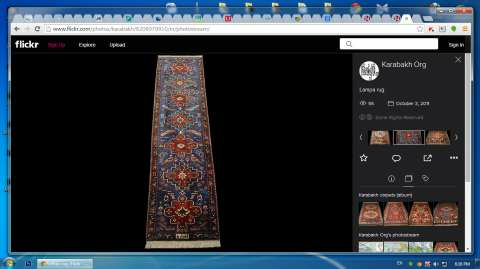 In XV century Netherlands painter Hans Memeling`s tableau `Maria with her child` we may find `Shirvan` carpet, in the work `Saint Maria` by Van Eykin we may find the carpet `Zeyva`, in `The Ambassadors` by German painter Hans Holbey (XV century) we may find the description of `Gazakh` carpet. In the II part of XVIII century the North part of Azerbaijan began to be separated into small feudal states: khanates of Sheki, Baki, Guba, Garabakh, Iravan, Ganja, Nakhchivan and Shirvan. 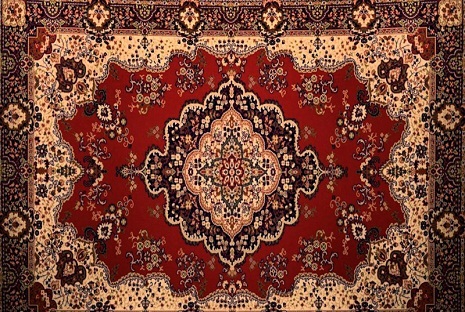 The carpet production greatly progressed in the period of khanates and each khanate had its own carpet manufactory, that caused the appearance of carpet schools. The best samples of carpets and products of carpet of Baki, Guba, Shamakhi, Ganja, Sheki, Gazakh, Javad gaza (a kind of territory) and other places, demonstrated In `Mocsow-Politechnic` exhibition held in Moscow in 1872 and in `Uni-Russian exhibition of industry and art` won gold and silver medals. 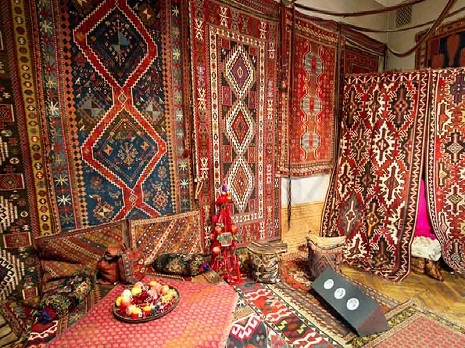 The major part of the exhibit demonstrated the International exhibitions held in Vienna(Austria) in 1872, Turin (Italy) 1911, London and Berlin 1913 made up carpets and carpet products brought from Azerbaijan. Kind of the carpets without pile. 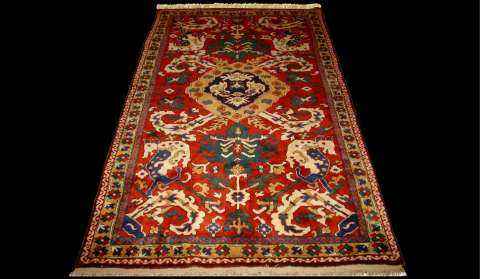 According to their technical peculiarities azeraijan carpets are divided into fleecy carpets and carpets without pile. The weaving of the carpets without pile dates to the earliest period of the art of weaving. Azerbaijan carpet schools. Azerbaijan carpets are relatively subdivided into 7 carpet schools according to geographical position, design, composition, color-selection and technical peculiarities. 1.The Guba carpet center located in the north-east of Azerbaijan, is subdivided into 3 parts- located on mountain, at mountain-foot and at lowlands. The centers of mountainous part are located in the villages of Gonagkend, Khashi, Jimi, Afurja, Yerfi, Budug, Giriz, Jek, Salmasoyud. 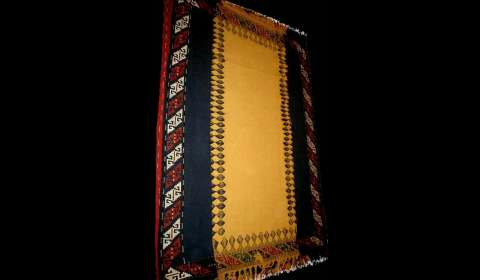 Carpet weaving at mountain-foot is centered at the villages Amirkhanli, Alikhanli, Khalfalar, Piramsan, Biliji, Shahnazarli, Pirabadil, Zeyva, Zohrami, Sumagobag, Khirdagul-chichi, Sirt-chichi, Dere-chichi, but that of at aran zone (at lowlands) is centered at Chay Garagashli, Haji Garagashli, Susanli, Garagashli, Devechi, Mollakamall. The carpets weaved in Derbend may also be added to that school. The decoration of Guba carpets are composed of ornaments of geometrical designs, stylized in motives of plants and sometimes animals. The carpets of this school are characterized with style of cheshni with medallion. 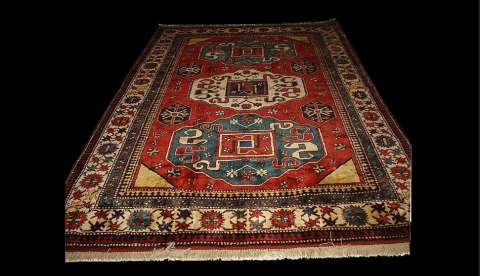 The best compositions of Guba carpets are " Gedim-Minare", "Gimil", "Alpan", "Gollu-chichi", "Pirabadil", "Haj?gayib", "Giriz", "Jek" and others. 2. The school of Baki embraces the villages of Absheron- Goradil Novkhani, Nardaran, Bulbule, Fatmayi, Mardakan, Gala, Khila and others, as well as the region Khizi, outside Absheron and its carpet centers- Gadi, Hil, Kesh, Findigan and others. Bali carpets are characterized with softness, intensity of the colors, original graphical elements and tenderness of the design. The decoration of the carpets are generally composed of the elements of geometrical lakes, the curved line plants. In coloring of Baki carpets for background spaces they use dark blue, and in rear cases red and yellow. Most of these carpets carry out the name of the villages they are made. Baki group includes cheshnies "Khilabuta", "Khila-afshan", "Novkhani", "Surakhani", "Gala", "Baki", "Goradil", "Fatmayi", "Findigan", "Gadi" and others. 3. Shirvan carpet-weaving school embraces Shamakhi, Maraza, Agsu, Kurdemir, Gazimammad (Hajigabul), Goychay and their villages. Shirvan group includes the compositions "Maraza", "Gobustan", "Shirvan", "Kurdemir", "Shilyan", "Shiralibey", "Chukhanli","Bijo", "Sor - Sor", "Hajigabul" etc. 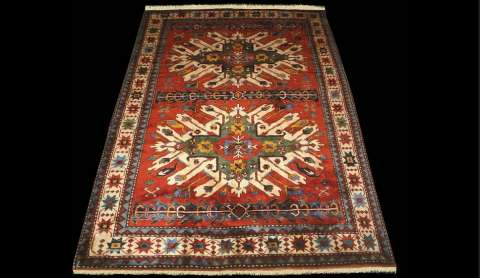 Rich composition and complex designes of Shirvan carpets are well known since middle ages. Artistic value of Shirvan carpets are known from diaries of German, English merchants and ambassadors of VI-VIII centuries. Those carpets could be seen in the tableaus of painters of XIV-XV century Europe. The painter of Netherlands Hans Memling described `Shirvan` carpet in his work `Maria with her baby`. 4.Ganja carpet school embraces Ganja and the villages surrounding it, as well as the territories of Gedebey and Goranboy, Shemkir, Samux regions. The center of that school is Ganja. Being one of the ancient cities of Azerbaijan Ganja is located in north-west of our country. Even in the X-Xi centuries Ganja was famous as a center of production of silk, woolen cloth and silk carpets. During centuries Ganja, as a center of high-quality carpets, had its own carpet manufactures. Ganja carpet school positively influenced carpet weaving of surrounding regions. Ganja carpet school includes such compositions as "Ganja", "Gedim Ganja", "Golkend", "Fakhrali", "Chaykend", "Chayli", "Shadili", "Chiragli", "Samux" etc. the carpet for namaz `Fakhrali" being of Ganja group is distinguished by its artistic peculiarities, and the style of weaving. 5.Gazakh carpet school includes the schools in Gazakh, Borchali, the territory of Georgia where Azerbaijanis live, and Goycha, located in the territory of Armenia, historical place of Azerbaijan people till 1988. Gazakh carpet area includes one of the ancient cities of Azerbaijan Gazakh and the villages surrounding it, and regions Agstafa and Tovuz. Goycha carpet center includes Bambak, Lambali, Ijevan, Gara-goyunlu and areas round Goycha (today`s Sevan). 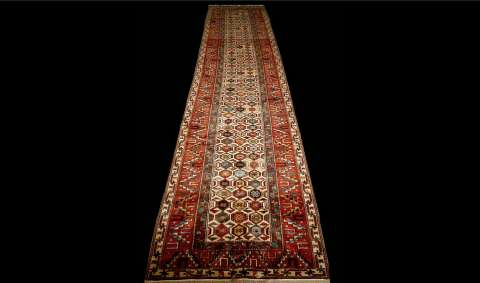 Borchali carpet center embraces such carpet points as Borchali, Garayazi, Garachop, Gachagan. 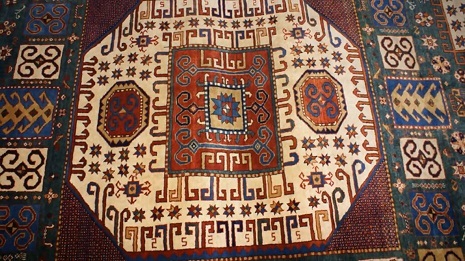 Gazakh group includes carpets with cheshnies such as "Shikhli", "Borchali", "Gaymaqli", "Garaqoyunlu", "Garayazi", "Garachop", "Gachagan", "Dagkesemen", "Demirchiler", "Kemerli", "Goycheli", "Salahli" and others.. The coloring of these carpets is created with the help of few colors. The designs of Ganja- Gazakh carpets attracted the attention of painters of the Europe already in the middle ages, and XV century Italian painter XV Carlo Crivelo in his tableau `Happy news` and German painter Hans Holbey (XV century) in `Ambassadors` gave the description of these carpets. 6.Karabakh carpet school-located in south-west of Azerbaijan developed in the region of mountain and aran. In Mountainous part of Karabakh, named in written records by Arabic historians Al - Mugaddasi, Masudi and others, as a great center of wool and cotton processing, Shusha city and the villages Dashbulag, Dovshanli, Girov, Trniviz, Malibeyli, Chanakhcha, Tug, Tuglar, Hadrut, Muradkhanli, Gasimushagi, Gubadli, Gozag, Mirseyid, Bagirbeyli, Khanlig, Tutmas played main role in XIXcentury carpet weaving. 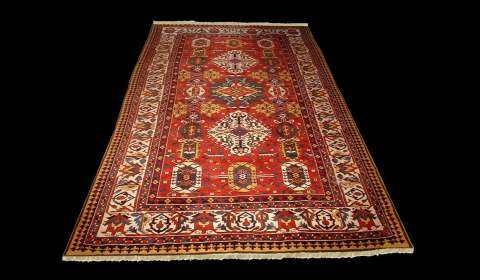 In the regions of aran, well supplied with raw material in comparison with that of the mountainous, Jabrayil, Agdam, Barda and Fuzuli play the main role in carpet production. Each of these centers included a plenty of villages the people of which intensively weaved carpets for sell. According to its artistic structure, technological peculiarities and colors Zangezur and Nakhchivan carpet weaving centers are also considered to be the members of Karabakh carpet school. Carpet compositions with cheshni such as "Aran", "Bagchadaguller", "Balig", "Buynuz", "Barda", "Bahmanli", "Karabakh", "Goja", "Gasimushagi", "Lambarani", "Mugan", "Talish", "Lampa", "Malibeyli", "Khangarvand", "Khanlig", "Khantirma", "Chelebi", "Shabalidbuta", etc. are classical patterns of Karabakh carpet school. 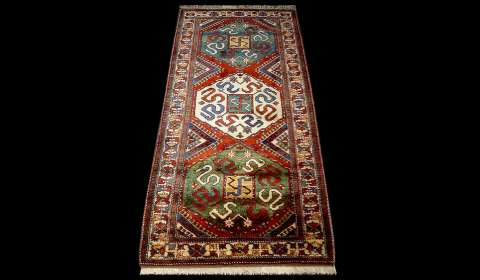 Karabakh is also characterized by a set of 5 carpets fitted to the interior-gebes(rugs). At the beginning of 1750 the khan of Karabakh Panahali khan founded Shusha.the first time the city was called Panahabad and it had for a long time been the center of Karabakh khanate. In the XVIII century Karabakh carpet school was centered in Shusha. Together with classical cheshni carpets in XVIII century Shuhsa produced new carpet compositions, cheshnis such as "Bagchadaguller", "Sakhsidaguller", "Bulud" the decorations of which were taken from salvers, aromatic soaps, prints and other every-day life equipments brought from Russia and the Europe. Karabakh carpets are very rich in color palette, which reflect the most delicate shades of colors of nature of Karabakh. Since ancient times background spaces on Azerbaijan carpets was colored in read. The colors were procured from the insect, as well as from the flowers. Among them cochineal is widely used to get the color of red. People call it "qirmiz bojeyi", "gurd girmiz", "palid jujusu"(`red insect`, `insect of an oak`). 7. The treaty of peace signed in village Turkmenchay near Tebriz in 1828, February 10 between Russia and Iran fixed at the history as Turkmenchay treaty and a war between Russia and Iran between 1826-1828 came to an end. According to the terms of the treaty the northern part of Azerbaijan included to the territory of Russia. Tebriz, Ardebil, Urmiya, Khoy, Maraga, Marand, Maku and other cities included into the territory of Iran. Thus Azerbaijan was been divided into two. The term of `South Azerbaijan` appeared after this event. Since that time all the patterns of Tebriz carpet school got the fame as the carpets of Iran. Tebriz carpet school is an ancient and famous scholl of Azerbaijan and embraces the regions of Tebriz, Ardebil, Maraga, Marand, Maku, Khoy, Urmiya, Zenjan, Garaja, Heris, Serab, Ahmedabad, Mirish, Ahar, Salmas, Goravan, Senna, Garadag and others. 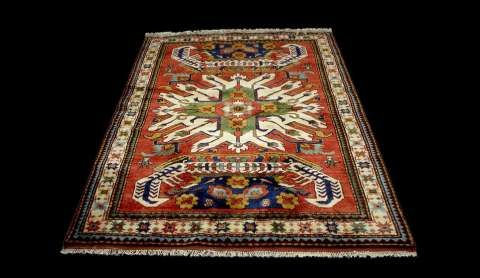 Turkish tribes, the settlers of this region played a great role in foundation and the development of carpet weaving from ancient times, and had significant influence on the formation of art of carpet in Iran at different periods. Being one of the most important centers of commerce and a rich city of the middle age East, its commercial relations with European countries also quickly developed the art of carpet. XI and XII centuries are the period of the renaissance of Tebriz carpet school, in XIII-XIV Tebriz mastered artistic features of the school of miniature, in XVI-XVII reached its highest level of development. Fleecy carpets and carpets without pile belonging to that school are different for its artistic arrangement, palette, and character of ornamental decorations. For main carpet composition Tebriz carpet school is divided into: Tebriz and Ardebil groups. Tebriz group embraces the compositions of "Tebriz", "Bakhshayis", "Gereje", "Goravan", "Heris", "Lechekturunj", "Afshan", "Agajli", "Ovchulug", "Dord fasil", Ardebil group includes cheshnis "Ardebil", "Sheykh Safi", "Shah Abbasi", "Sarabi", "Zenjan", "Mir" and "Achma-yumma". Carpet school of Tebriz is also well known for such classic compositions as "Bag-behisht", "Bag-meshe", "Balig", "Buta", "Dervish", "Ketebeli", "Gordest", "Gollu-gusheli", "Guldanli", "Leyli ve Mejnun", "Meshahir", "Mun", "Namazlig", "Nejagli", "Servistan", "Serdari", "Sahand", "Silsilevi lechek", "Farhad ve Shirin", "Khayyam", "Khatai", "Heddad", "Charxi-gul", "Jeyranli", etc.the composition "Lechekturunj" weaved in Tebriz and the famous carpet "Sheykh Sefi"(sizes 56.12 m2, 1539, London, `Victoria and Albert` museum) are best pattern of ornamental carpets, and the masterpiece of Tebriz carpet school. In spite of that classic canons in composition, picture and palette are sometimes disturbed in these carpets, different artistic and technical means help to decode the plot. The best had been done to develop carpet weaving in Azerbaijan. As a branch of art and a science carpet weaving is taught at Azerbaijan State school of Painters named after A.Azimzadeh, at Azerbaijan State University of Culture and Art, as well as at colleges specialized in art. It is also taught at technical schools, children picture galleries and other institutions. The study of Azerbaijan carpet weaving as a branch of a science and its modern development in the creativity of professional painters is related with the name of Latif Kerimov (1906-1991), national painter of Azerbaijan. Latif Kerimov , well known as a master of Oriental and art of Azerbaijan carpet and the art of decorative-application, the prominent ornamentalist, a painter, a scientist -investigator, studied Azerbaijan carpets for a long time, enriched Azerbaijan art of decoration with new ornaments, created new decorative motives on the basis of traditional elements of design. 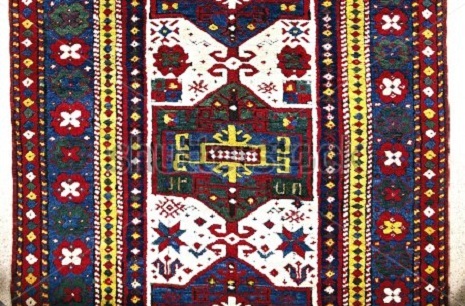 Ornamental and portrait carpets "Afshan" (1932), "Gonagkend" (1939), "Lechekturunj" (1952), "Shusha" (1953), "Goygol" (1958), "Karabakh" (1960), "Islimi" (1964), "Butali" (1965), "Bahar" (1966,1976), "Heyvanlar alemind?" (1969), "Shebi-hijran" (1975), "Zarhara" (1977), "Firdovsi" (1934), "Samed Vurgun" (1956), "Vaqif" (1967), "Fuzuli" (1972), "Nasimi" (1974), "Safiaddin Urmavi" (1975), "Acemi" (1976) and others weaved on the drafts of Latif Kerimov are valuable patterns of carpet weaving for matching of ornamental elements, the completeness of composition, tenderness and expressiveness of pictures and rich palette. For carpet `Stalin` created in 1949 with the collective help of authors, he was awarded USSR State Reward in 1950. his personal exhibition open in 1986 in London got great success, where he presented his works such as "Bandi-Rumi" (1980,1981), "Lachakturunj" (1981), "Khatai" (1981,1985), "Ashma-yumma" (1982), "Lachakbandlik" (1983), "Katababandlik" (1984), "Asrlerin nagmesi" (1985) etc. In book of L. Kerimov `Azerbaijan Khalchasi`(`The carpet of Azerbaijan`) published in many volumes, one can find the analysis of ornamental elements of more than 1300 Azerbaijan carpets.